New Piezo technology is powerful, energy efficient and lightweight. Adjustable volume and three modes (talk, siren and whistle). Technology significantly reduces weight and increases battery life (lasts 40hrs continously with 8 C batteries, not included). Comes with handheld microphone. Full frequency response; weatherproof design Up to one mile range. Pistol grip and wrist strap. Audio Range: 1 mi. 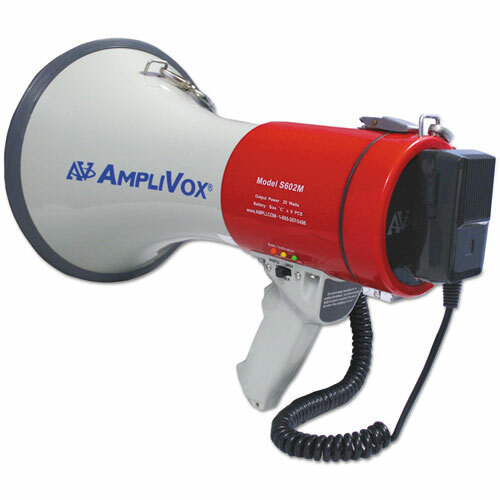 Powerful Piezo technology enhances the 25 watts of this unit to equal 40 and 50 watt units from other manufacturers. Easy to use with detachable corded mic and shoulder strap for all day use. Also has features like volume adjustment, weather resistant casing and battery indicator which other manufacturers don't have! 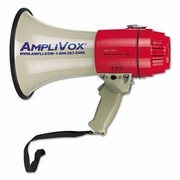 25 Watts / Range: 1760 Yards / 2 3/4 lbs / Requires 8 C-Cell Batteries (Batteries store in convenient battery pack) for up to 40 hours continuous talk time.